The Internet of Things (IoT) is powering transformation for enterprises, consumers, and governments. Emerging tools and technologies like smart speakers, machine learning, and 5G are enabling huge gains to efficiency and more control at home and in the workplace. The continued growth of the IoT industry is going to be a transformative force across all organizations. 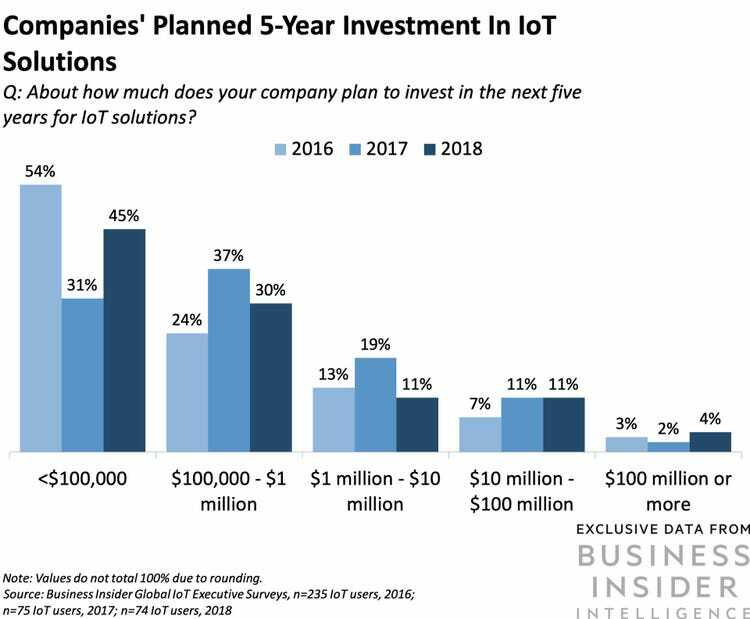 By integrating all of our modern day devices with internet connectivity, the IoT market is on pace to grow to over $3 trillion annually by 2026.
Business Insider Intelligence is keeping its finger on the pulse of this ongoing revolution by conducting our third annual Global IoT Executive Survey, which provides us with critical insights on the most pivotal new developments within the IoT and explains how top-level perspectives are changing year to year. Our survey includes nearly 400 responses from key executives around the world, including C-suite and director-level respondents. The proprietary data obtained in our survey has helped us continually refine our IoT market growth projections over the years. This year’s survey data shows that companies’ plans to invest in IoT solutions are accelerating with 5G on the horizon and an uptick in IoT adoption. We forecast that there will be more than 64 billion IoT devices by 2025, up from about 10 billion in 2018, and 9 billion in 2017. Companies mentioned in this report are: Alibaba, Alphabet, Amazon, Apple, Around Analytics, Arm, AT&T, August Home, C3 IoT, China Mobile, Dallas Innovation Alliance, Dell, Ericsson, Filament, FogHorn, Google, Grubhub, Guardzilla, Huawei, ibex, Intel, Microsoft, Next, Nokia, Pandora, PsiKick, Qualcomm, SAM, Samsung, Sidewalk Labs, Spotify, STMicroelectronics, Verizon, Whirlpool, and Xage. We project that there will be more than 64 billion IoT devices by 2025, up from about 10 billion in 2018. Blockchain within the IoT is still generally the provenance of startups, and they’re populating the marketplace with products that take advantage of the technology’s characteristics. It’s not going to upend the IoT, despite the technology’s much-ballyhooed potential. And respondents to our survey of IoT providers seem, for the most part, to understand this. Just a small percentage think that blockchain will become a universal standard in the IoT. The vast majority said that blockchain will either be a tool that most companies employ at times, or a niche product that only certain solutions use. Lightning-fast 5G networks will change how telecommunications shapes business and will also offer new and transformative possibilities in the IoT space. The new standard will further increase the appeal of cellular solutions in the areas where it’s available. And that’s why nearly half of IoT providers said they’re planning to introduce support for 5G networks to their solutions within the next two years.